Apple has finally unveiled the iPhone 7 and iPhone 7 Plus in San Francisco. The new phones to the legendary iPhone series have been introduced with various redefined and advanced features to enhance the user experience. And why not? It's the Apple, known for its perfection when it comes to phones. Apple has officially revealed the prices of the all-new iPhone 7 and iPhone 7 Plus on the official Indian website. iPhone 7 starts at INR 60,000 for the 32GB variant and iPhone 7 Plus starts at INR 72,000 for the 32GB variant. 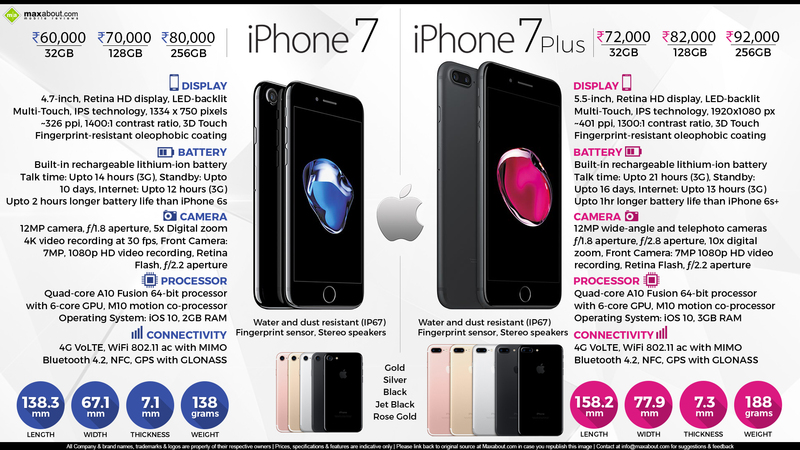 The top variant of iPhone 7 and iPhone 7 Plus are priced at INR 80,000 and INR 92,000 respectively. This time Apple has come up with increased storage: 128GB and 256GB giving away with the 64 GB model. Here are the detailed features and specs in the new iPhone 7 and iPhone 7 plus. Click here to know more about Apple iPhone 7. Camera: 12MP wide-angle and telephoto cameras, optical zoom 2x and digital zoom 10x. Click here to know more about Apple iPhone 7 Plus. Camera: Panorama (up to 63 megapixels), Autofocus with Focus Pixels, Live Photos with stabilization, Wide color capture for photos and Live Photos, Body and face detection, exposure control, Burst mode etc. Downloaded 63 times this week.